If you use Plex’s Roku app to stream your personal media files, you should be in for a pleasant surprise. The app has just received a major update, with a modern look that’s much easier to navigate. The previous version of Plex for Roku looks dated by comparison. Everything was too spread out, and you couldn’t view the titles of each video without scrolling over them individually, so it was a pain to navigate. The app didn't seem hospitable to music playback either, as you couldn’t see your current track list from the main playback menu. All of that’s been improved in Plex's update. The home screen has quick shortcuts to movies, music and TV shows, and the content thumbnails are much denser, with titles underneath each one. For Plex Pass subscribers, selecting a movie or show also provides extra content, such as trailers, artwork and behind-the-scenes clips. Music playback now features artwork and track lists next to the currently playing album. 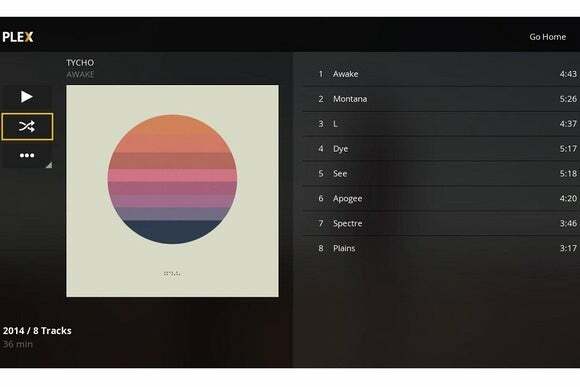 Plex's music player now includes track lists and album art--but no playlists just yet. On the downside, Plex is still working on adding some standard features to the new app. Photos, Channels, and Playlists aren’t supported right now, but Plex says they’re coming soon. As always, Plex’s Roku app isn’t much use on its own. It’s just a way to view content that you’ve stored on other networked computers or hard drives, using Plex’s media server software. That way, you can serve up your collection of videos, photos, and music without having to store them on your TV, set-top box or game console. For new users, the app is free to try for 30 days. After that, you'll need to buy the app for $5 or subscribe to Plex Pass, which costs $5 per month and includes extra features such as trailers and extras, managed accounts and cloud file syncing. Why this matters: Plex says it’s consistently one of the top five most popular downloads for Roku, and is used on more than 1.4 million Roku set-top boxes. The update brings the Roku app in line with Plex’s existing apps for Xbox, Playstation, and Smart TVs. In other words, it’s now much less of an eyesore for the many people who already use it.